A city floating in the ocean, one where tens of millions of people can live? No, not Atlantis but a project that a group of self-styled "seasteaders" want to get built off the shores of San Francisco by the year 2040. Before dismissing this as a crackpot idea - and some experts have done just that - consider the following: Venture capitalists have already ponied up more than $2 million to fund an idea to build a nation flotilla - and a libertarian one at that - some 12 miles off the coast of California. Of course, critics once poo-pooed the idea of sailing past the Pillars of Hercules or trying to send humans to the Moon. Maybe this is just one of those Big Ideas way ahead of its time? That's the hope of Milton Friedman's grandson Patri, a former Google engineer whose vision is to build a libertarian nirvana a dozen miles off the California coast. Being a true libertarian, Friedman hopes to foster conditions for startup governments to thrive which are "consumer-oriented" and "constantly competing for citizens." "I envision tens of millions of people in an Apple or a Google country," he told the Chron. "If people are allowed to opt in or out, you can have a successful dictatorship." One can envision potential legal and diplomatic challenges down the road. But Friedman has already thought that out. 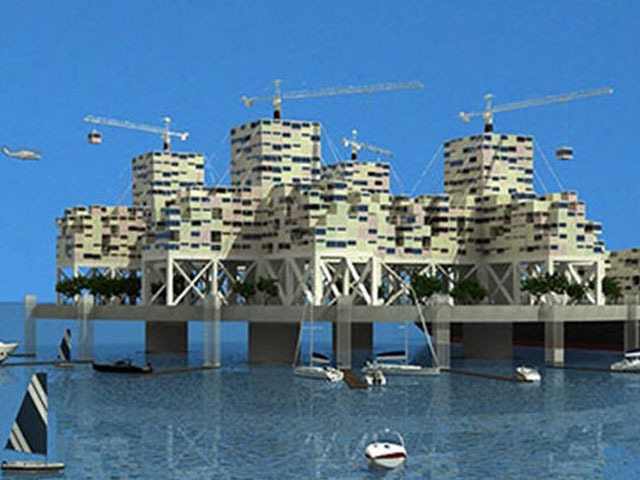 A couple of years ago, he was profiled by CNET, where he sketched out the idea of seasteading. He explained how a short-term work-around would be to buy a ship registration in the same way that most merchant ships do. Questions of sovereignty and secession would come later. "Innovation in society and serving marginalized groups has always happened on the frontier," Friedman said in the interview. "We don't have a frontier anymore. The reason our political system doesn't innovate anymore is that there's no place to try out new things. We want to provide that place." Nothing crazy about that. But it will remain a pipedream until engineering technology advances to the point where it can turn that dream into a reality.